Switchboard Live integrates with a variety of softwares and hardwares to create a convenient and comprehensive multi-streaming experience! Our mission is to help content creators get more exposure and engagement on their live videos by providing a multi-functional distribution platform known as Switchboard Cloud. Through our partnerships with fellow visionaries in the industry, we’re able to not only achieve this goal, but also shape the future of live video distribution and consumption. 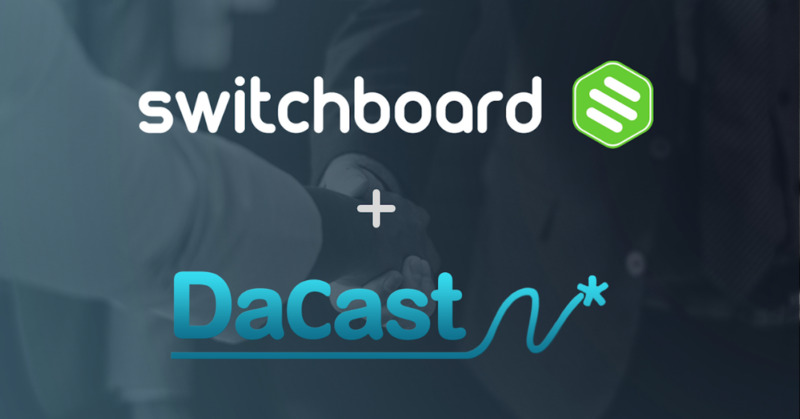 We are excited to announce our newest integration partners, DaCast. 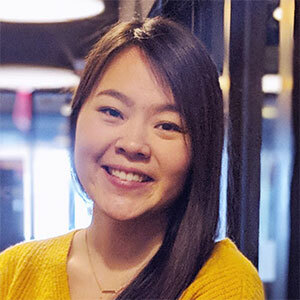 DaCast caters to professional streamers seeking a self-service, white-label streaming platform. With their HTML5 player, backed by Akamai CDN, users can embed live video anywhere for maximum and high quality reach across all devices. Additionally, DaCast offers features such as customizable player skins, pay-per-view, ad network integrations, geo-fencing and more! What does this integration mean for Cloud and DaCast users? The ultimate management and distribution of your live videos with the few clicks of a button. 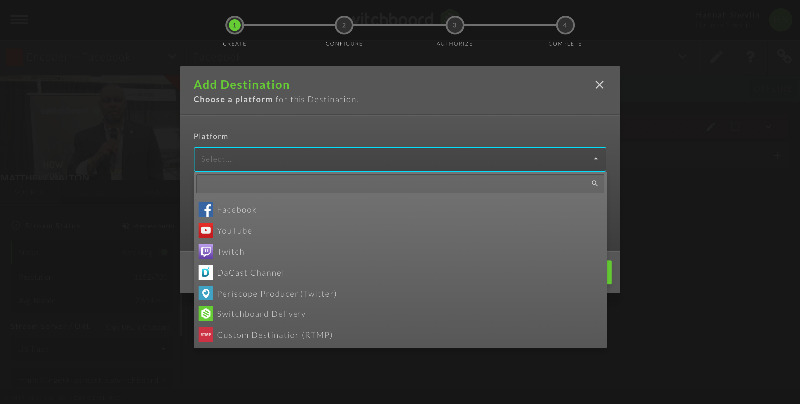 In the Switchboard Cloud platform, DaCast is now an official streaming destination. No longer do users need to enter their DaCast channel as a Custom RTMP feed. 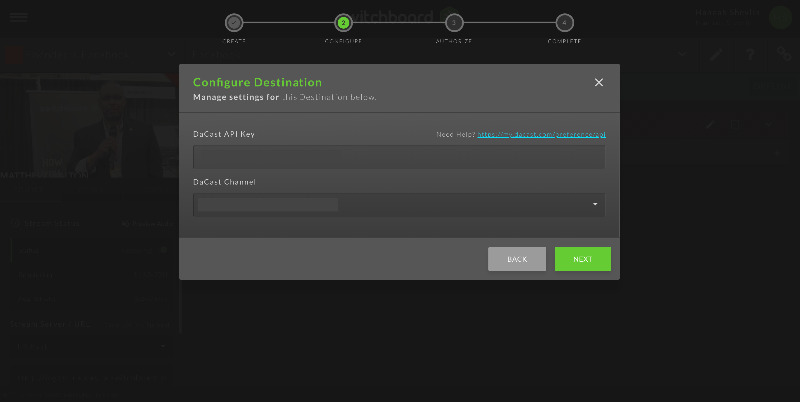 To connect your DaCast channel to Cloud, all you need is your DaCast stream url and stream key. Once it’s added, you can then simultaneously send your single live video stream across all of your social channels and website(s). That’s right. A single camera, single encoder, and numerous destinations across a variety of platforms and mediums. And within the Cloud platform, you can put titles, descriptions, and tags into templates for quick and easy application - that way you don’t have to manually create that information for each channel you are streaming to. We expect our integration with DaCast to open the doors for content creators and businesses who want to take full advantage of social, and OTT, live streaming. Together, our products create a limitless experience for your live streaming needs and digital marketing ambitions!